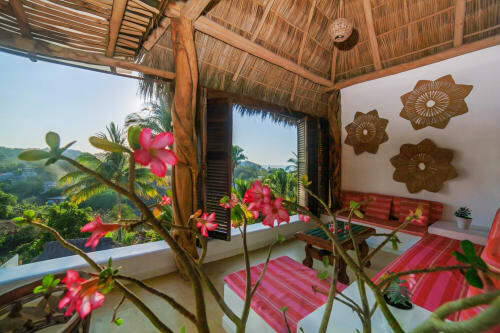 Casa Jaqui in Sayulita is a beautiful home south of the village square. It consists of four one-bedroom apartments and one two-bedroom apartment, all tastefully furnished and completely equipped to provide every convenience during your vacation. As of April 2017, each apartment, and the pool area, has a dedicated wifi access point with high-speed internet. The enclosed grounds have been professionally landscaped, and each unit has a separate entrance from the courtyard. The building showcases the beautiful handiwork of Mexican artisans and journeymen, from the hand-turned Primavera wood doors and cabinets, to the intricate inlaid stone panels on the master staircase and surrounding the pool. Location: Casa Jaqui is located on Calle Naranjito (“street of little oranges”), a quiet dead-end street in Sayulita in a friendly, safe neighborhood just south of the town square. The house sits on a short rise about ten minutes on foot from the beach, and enjoys a light fresh breeze on the hottest days. All units have a pleasant valley view. Apartment Amenities: All apartments are air conditioned and have separate bedrooms with king-sized, encased, pillow-top mattresses; in-wall combination keyed safes; large decks with seating; completely equipped kitchens with stainless steel appliances; large bathrooms with oversized showers and good water pressure; air conditioning; Primavera hand-turned wood doors, windows and cabinets; fans from Modern Fan Company; extensive Talavera tile work in kitchens and bathrooms; and Mexican terra cotta tile flooring. The bedrooms have secure screen doors, making it possible to sleep with the windows open. Each apartment enjoys the convenience of on-demand hot water, and a 64 square meter cistern ensures a steady supply of water. Starting December 2017, all apartments will have bluetooth speakers. Shared Amenities: The building was designed with security in mind. The premises are contained within a 7-ft. wall; access is through hand-wrought iron gates. The large pool is fed by a stone water feature and surrounded by the exquisite flora of the tropical climate, all professionally landscaped by designers Lisa and Gretchen Bauer. Oversized garages, equipped with keypad automatic doors, are available, if needed, at no charge. Services: Daily housekeeping service is professionally provided by Maria. The English-speaking property manager will meet you at the house to provide the key and show the premises. He is available throughout your stay for recommendations or assistance. We spent two weeks in this Paradise! Not only wonderful accommodations, but Steve & Jackie were beyond accommodating! Any request was met with "Not a Problem". Couldn't ask for nicer hosts!! We had friends come down for the second week, staying in the unit next door, and the adjoining balcony was a very welcomed feature! All units have a "Comments" guestbook, signed by previous guests, that contains very helpful information on the town/ restaurants/beaches/ and many more tips to help you plan your stay. I would love to find something bad to say, just so it would be easier to book next time, but I guess we'll just have to plan our trip a little earlier to beat the rush. Muchas gracias por todo lo que haces, Steve y Jackie. ¡Te veremos pronto! Our second time staying at casa Jacqui and our experience was even better than our first. The updates on the property are continuous and the casa is kept in immaculate condition. 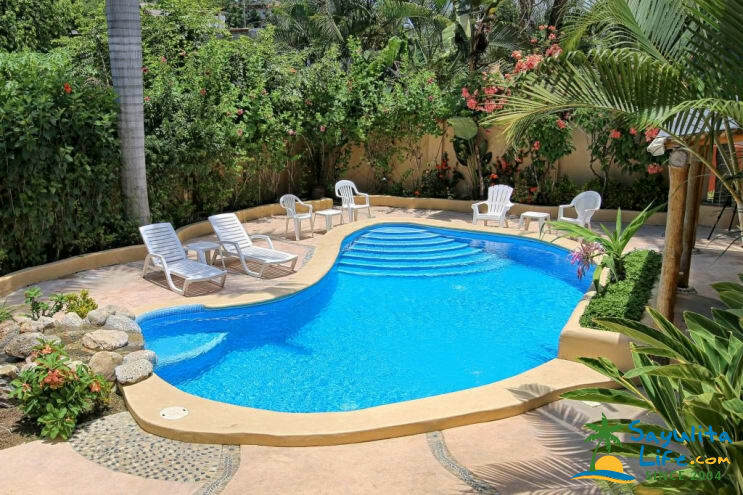 The pool is so well maintained and a great option to the beach, which is only a few minutes away. We will be back! Will continue to come back to casa Jaqui every year we love this place only wish we had was an umbrella by the pool we told the owners and it was done the next day. My husband and I stayed at Casa Jaqui for 5 nights and loved it. Very clean, very thoughtfully laid out apartment, private, with a large comfortable bed and large deck overlooking the pool and all the greenery of the hillside. Our hosts were exceptional; checking in on occasion, giving great advice and recommendations. We love this place and will definitely be back! Casa Jacqui was just perfect! We loved staying here and hope to come back next year! The owners were lovely and very thoughtful. They met us when we arrived to make sure we had everything we needed and more. The apartment was spotless and the kitchen very well stocked with everything one could need. The bed was super comfortable. The deck overlooking the pool was beautiful. We enjoyed spending evenings reading there. I would highly recommend staying here. A Trifecta - Great Location, Awesome Accomodations, Fabulous Hosts! My partner and I are very careful reading reviews before booking a holiday rental and I have to say that everything we've read about Casa Jaqui is true. Casa Jaqui's location is both a short walk and quiet paradise from the busy town site only a few minutes walk away. We found everything we needed within walking distance and didn't miss a vehicle whatsoever. Our accommodations were secure, in excellent condition and kept that way throughout our stay (Thanks Maria!). A minor problem with the water system was repaired promptly and without inconvenience again speaking to the quality of our hosts, Jackie and Steve. Definitely planning a revisit to this fabulous town and staying at Casa Jaqui! This was a perfect spot for my vacation in Sayulita. Easy walk to town, and far enough away to have peace and quiet at night time. I loved the big balcony to relax and to watch the sunset. Comfortable bed, fully equipped kitchen, and fast wifi. Currently, there is a building going up adjacent to the property, so there is construction noise during the day, but I am an early riser and was generally off to the day's adventure, so it didn't bother me. Some noise from the floor above also can be heard - bring earplugs if you are a light sleeper. Jackie and her husband were very welcoming and helpful during my stay. Superb communication and trustworthiness. 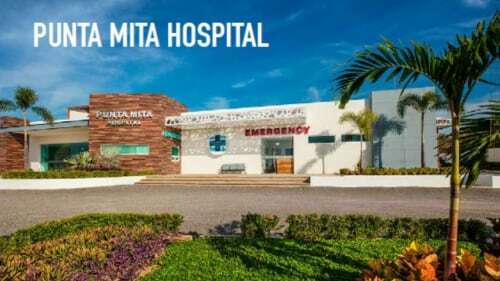 Overall very affordable, pleasant stay in a convenient location. Would come back again. Thank you Jackie! 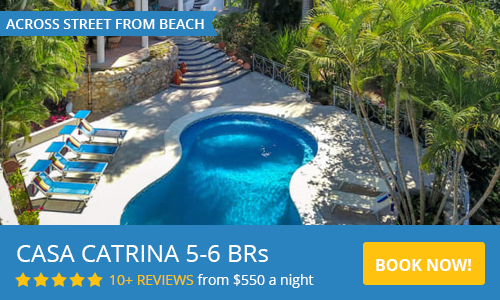 I can't imagine a more wonderful place to stay in Sayulita! The Casa was beyond my expectations! Clean, spacious, and very authentic. The apartment had everything one could possibly need! The kitchen was fully stocked including a coffee pot and toaster! Quiet location with amazing pool! I highly recommend!!! Owner is really fast on communication, will do all what they can to make your stay enjoyable ! The place is clean including the pool. Don't bother with security all the property is gated. I accept Zelle, Xoom and MoneyCash, Venmo, and if you have a favored payment app, I am willing to try it. I will accept wire transfer if necessary, but be aware that wire transfer is expensive and generates fees on both ends of the transaction. I don't take Ethereum or Bitcoin, YET. Rates for one-bedroom and two-bedroom, four-night minimum stay please. Either I, or the manager, will meet you on site to give you the keys and show you around the property. The manager lives nearby, and when I am there, I live on site. We are both available any time to help you, or suggest restaurants, entertainment, etc. It's your choice: you can see me every day, or I can stay completely out of sight. We look forward to having you.